Carrying on with the 1790s storyline. 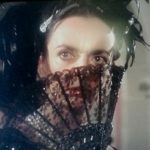 In 1991, Phyllis Wicke remains dangerously ill with diphtheria, but she retains a connection with the events she was once part of in 1790 before she and Vicky switched places. In her delirious state, she tells the present-day inhabitants of Collinwood that it was such a pity, that handsome young man being killed. She’s referring to Jeremiah Collins, Barnabas’s younger brother. The pastor performing the service speaks of Jeremiah dying in a “tragic firearms accident” instead of being shot in a duel. The Collinses are already hard at work covering up their family secrets and rewriting the past. Witchfinder Trask interrupts the funeral, arriving to arrest the witch responsible for this calamity: not Angelique, but Victoria Winters. The family protests, apart from Aunt Abigail, who literally points an accusatory finger at Vicky. Trask hauls Vicky into a carriage and takes her to the Collinsport Gaol. Barnabas comes to the jail to stop any interrogation before Trask can lay a hand on her. He seems to think the whole thing is ridiculous even if the old witchcraft laws are still on the books, and tries to reassure Vicky that nothing bad will happen to her; she’ll be acquitted and she certainly will never be hanged as a witch. But if you remember the original series, you know exactly how this is going to turn out. Vicky has every reason to be worried. Angelique, meanwhile, is free to carry on with her witchy plans to make Barnabas her own. Certain that Josette now hates Barnabas forever shooting Jeremiah, Angelique shows up again at Barnabas’s bedroom door and offers to console him. She says that she knows what he needs. He shouldn’t have phrased it that way, since it only gives Angelique her next idea. Angelique demonstrates how to raise a recently dead young man as a zombie: First, you need some personal items belonging to the deceased, a handkerchief and gunpowder kept in a horn. 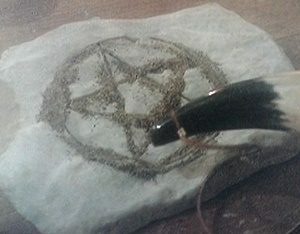 Form a pentagram on the handkerchief with the gunpowder while reciting your incantation, then set the gunpowder alight. Your chosen subject will then shamble up out of his grave and be ready to do your bidding. What Angelique commands Zombie Jeremiah to do is carry off his widowed bride and destroy her. Everyone at the old house hears Josette scream when her late husband comes for her, but by the time they reach her room, both are gone. All that’s left is Josette’s locket, which Naomi finds on the floor and recognizes as the one that was buried with Jeremiah. Can he still be alive? The men at Collinwood quickly form a search party and catch up with Zombie Jeremiah and Josette at Widows Hill, where he’s about to toss her over. Barnabas calls out to his brother to stop. If Jeremiah did love Josette, then he can overcome whatever evil power commands him and not harm her. Jeremiah wavers at the edge of the cliff, torn between Angelique’s instructions to “Destroy her! Destroy her!” still ringing in his head and Barnabas’s and Josette’s pleas for him not to. In the end, the love-spell proves stronger than his zombification and he puts Josette down. He speaks the name of “Angelique” to tell Barnabas who did this to him, then he jumps. Barnabas knows now what’s really been going on. When he and the other men bring Josette back to the house, he tells the Countess to keep close watch over her and to keep Angelique away. It seems to him that the obvious thing to do is break apart the figures and break the spell, but the Countess (who knows something about magic herself even if she doesn’t practice), insists that this would be too dangerous. Only the witch who cast the spell can break it, or else Josette will die. Barnabas storms back up to Angelique’s room to confront her and demand that she remove her spell from Josette. She refuses, offering him the choice of seeing Josette dead or alive and forever in love with the memory of his brother. 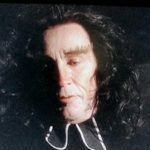 Instead of choosing, Barnabas says he’ll take his proof to the town magistrate and see her hanged as a witch so that he and Josette can dance on her grave. Once she’s dead, the spell is broken. Downstairs in her own room, Josette is suddenly freed and for the first time since the duel wants to see Barnabas again. Barnabas and Ben Loomis bury Angelique’s body in the woods that night, but a thunderstorm rolls over Collinwood soon after they’ve gone, and lightning ominously strikes the grave. There’s a storm over modern-day Collinwood too. A fresh entry in Sarah’s diary has informed Barnabas of Vicky’s arrest and pending trial for witchcraft. He and the other Collinses (plus Maggie) gather to hold a second seance to try and bring Vicky back. The attempt to rescue Vicky doesn’t work, but Angelique’s evil spirit takes this opportunity to enter the 20th century by possessing someone at the table. The 1790s storyline goes as expected as far as the main points are concerned; if you’ve seen this part of the original series, you know what’s going to happen to Jeremiah, Barnabas, Josette, Vicky, and even little Sarah, and these events occur with minor details changed but no surprising twists. The 1991 story that’s intertwined with it, however, is entirely new and contains some real surprises, so I’m not going to discuss much of what goes on in those scenes. Back in 1790, Peter Bradford is acting as Vicky’s attorney for her defense. Even though it won’t help her case, she tells him the truth about who she is–that’s she come from 200 years in the future to change something in this time. As proof that she’s not insane, she sends him to read the Collins Family History book, which she brought with her and hid in a dresser drawer in her room at the old house. After he’s buried Angelique, Barnabas talks to his family about seeing that Vicky is exonerated now that the true witch has been discovered. He has no reason to think that he and Josette can’t go on with their original plans, be married after a suitable mourning period, and live happily ever after. He’s not very surprised when he goes up to his room and finds Josette waiting for him. They are kissing passionately, when she bares vampire fangs and sinks them into his throat. It’s not Josette at all, but Angelique taking her revenge. My first thought was that this is better than the silly cartoon bat that attacked Barnabas in the original series, but then we get that here too. Transforming into a CGI animated bat, Angelique hovers over him and taunts him before flying out the window to leave him bleeding to death on the floor. Peter Bradford arrives at the old house that same evening to learn about Barnabas’s death, which the servants are calling an attack by some vicious animal, although no one seems clear on how it got into the house. 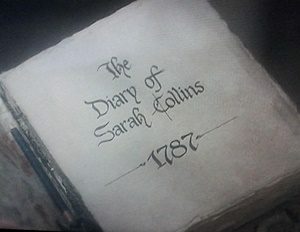 Peter and the Countess go up to Vicky’s room to find the book on the Collins Family History, which was published in 1974; they read the pertinent part about events concerning themselves, plus the things Vicky’s written as part of her own journal as a time-traveler. They accept Vicky’s story quite easily, although they don’t believe everything they read in the family history. It doesn’t match facts which they know to be true, such as Barnabas going to England after his brother’s death, when he’s just died himself. The book says that Josette fell off Widows Hill five days after Barnabas departed, but she’s already faced danger at the cliff’s edge and was saved the day before. Then they go back downstairs in time to hear Joshua Collins declare his plans for keeping the death of his eldest son a secret; he’ll explain Barnabas’s absence by saying he’s gone on an extended trip to England. Peter and the Countess exchange alarmed glances. Is Josette still in danger after all? The Countess tries to get her niece to leave Collinwood before Josette meets her fate at the cliff’s edge. She even shows Josette the book, but Josette refuses to go. She means to stand by Vicky. One of the things I like best about this revival series is that the Collinses (except Abigail) and the duPres family are all supportive of Vicky and believe in her innocence. 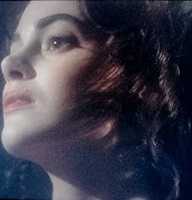 I realized that my feelings for Josette in particular changed during the course of the old show: I liked her very much as the ghost-guardian of the Collins family and as Barnabas’s tragically lost love, but her treatment of Vicky–if understandable under the circumstances, if she really did believe that Vicky was the witch who cursed Barnabas–made me like her less as a living person. This Josette, on the other hand, made friends with Vicky during the few hours she spent at Collinwood before eloping with Jeremiah. Like Vicky, she instantly felt the connection between them–as if they aren’t just two girls who look alike, or even twins, but part of the same soul. Because of their connection, Josette feels that saving Vicky would be like saving herself. Now that Josette knows that she’s from the future, Vicky turns this back on her; she believes that the thing she’s come back in time to prevent is Josette’s tragic end at Widow’s Hill. If she can save Josette, then she will return to her own time and escape being hanged as a witch. It’s really a lovely scene between them, especially considering that Joanna Going is playing both roles. Vicky’s argument convinces Josette to leave Collinwood. Meanwhile, Barnabas has been secretly entombed in that hidden room at the back of the family mausoleum, where Joshua used to hide guns and ammunition during the Revolutionary War. But you can’t keep a Collins boy down. Like Jeremiah, Barnabas is up and about the night after his death. He seems bewildered by his new, undead existence, but guided by some sort of animal instinct. Picking up a scent (of blood?) in the night air, he runs from the mausoleum int o the woods. For a fledgling vampire, he handles his cape very nicely. During the day, Naomi Collins had begun to show signs that her mind was fragmenting over the sudden and inexplicable deaths of her “beautiful sons”. She’s terrified for the safety of the two younger children. Joshua’s response to her fears was to decide that everyone must abandon the old house immediately and go to live at the new Collinwood. The household has been packing up and moving all day. By the evening, everyone’s at Collinwood except for Ben Willis and Millicent Collins. Millicent hasn’t had much to do in this storyline, but the running joke about her bringing so much luggage finally pays off. She’s gone back to the old house to see about her trunks that Ben’s left behind, and she happens to be alone in the entry hall when Barnabas come home. He demonstrates that he’s been a cousin-biter from the very first. Angelique’s spirit makes an appearance, laughing and taunting Barnabas about the monster she’s made him into. She adds a bit more to her curse, telling him that all who dare to love him will die. Horrified, Barnabas prays over his first victim for God’s help, but divine intervention isn’t forthcoming. 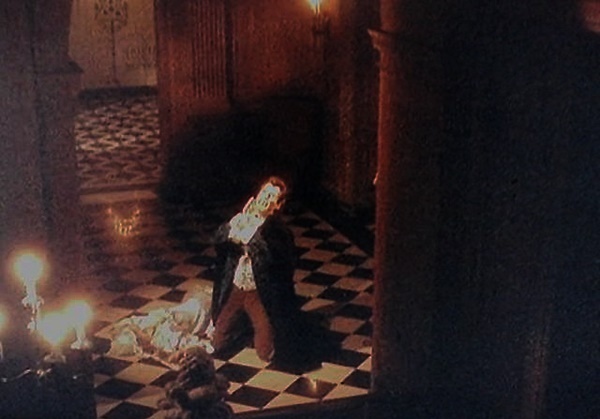 Ben finds Millicent on the floor, bloody but still alive, and takes her over to Collinwood. 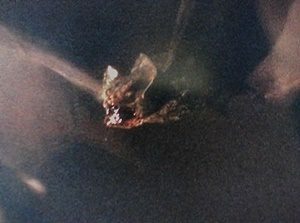 It appears to everyone that she’s been attacked by the same “animal” that killed Barnabas, but it’s Barnabas’s name she murmurs. Speaking of cousin-biting, in 1991, Carolyn’s been seeing Barnabas for blood donations so often that Joe Haskell has grown suspicious. When he notices the bites on her neck, he knows the truth and goes to the sheriff. George Patterson turns out to be no slouch as a detective; he tells Joe that Barnabas has been at the top of his suspect list for some time, but after that embarrassing incident when Professor Woodard dragged him over to the old house for a confrontation, he can’t act without proof. 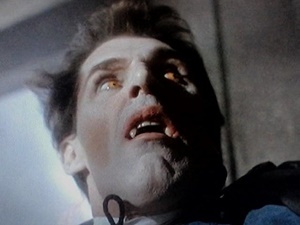 He’s been checking up on Barnabas via Interpol, and has learned that no one in London has heard of a Barnabas Collins. Back in 1790, Barnabas returns to his old home at sunrise and takes shelter before the light of day destroys him. I note that he doesn’t actually need a coffin for protection, but goes down into the cellar where he huddles on a pile of grain sacks and throws his cloak over his head. The next night, Barnabas heads over to Collinwood to stand below the window of Josette’s new bedroom and perv on her the way he will perv on Vicky 200 years in the future. After Josette goes to bed, he goes up to her, intending to bite–but Millicent intervenes. “Take me!” she demands, and he does. Sarah and Daniel stumble on their cousin’s body while playing in the woods near the house the following day. This is the family’s third funeral in about a week, but it won’t be the last. Josette’s next. She truly does intend to go away for her own safety, but Fate isn’t that easy to escape. That night, as she’s packing her things to leave with her aunt, she discovers that she’s left her music-box behind at the old house and she won’t go without it. She goes back over to her old room to fetch it… and meets Barnabas there. That he’s there changes everything for her. At first, she’s delighted that he isn’t dead and doesn’t understand why he insists that she go away. Barnabas doesn’t know about her upcoming Widows Hill death, but he knows that he can’t control his vampiric hunger around her and doesn’t want her to become his victim. He promises that, even if they can’t meet again in this life, she will recognize him “in another time, another world,” but that isn’t enough for her. When he can no longer control himself and reveals what he’s become, Josette isn’t horrified. She offers him her neck.